From the Warp: Defined terrain, a must have game mechanic? Defined terrain, a must have game mechanic? I've always thought the tables I play on and the terrain I use didn't look like the stuff used at Games Workshop. Of course they have some "better" quality stuff, but that wasn't it. And then it dawned on me. If you look at the terrain on a game table in a White Dwarf battle report, you might notice that there is something missing. It's not glaringly obvious, but once you realize it's gone, it definitely stands out. Clear boundaries for area terrain. Sure, they have (and use) area terrain, but there are no clear boundaries for it. In fact, they go to the point of blurring the edges of well defined terrain pieces. So how do have area terrain without clear boundaries? It's a mechanic we all use to define what units are in and out of terrain and what modifiers if any are applied to those units right? How do you play on a table with area terrain if you don't know exactly where the boundaries for it are? We've all seen it and I would venture to say we've all used it since it's how we probably learned to define "area terrain." The base. You lay down the base or shape that represents the area of trees or whatever you want and then you toss down a few trees or rocks onto the base to remind you of what it is. Instant area terrain in a nice, neat package without any problems. You know who's in and who's out at a glance. But what about these guys? Can two people play on a board without all those clearly defined edges? Maybe I should ask, can you play on a board like that? I figured I would try it. Turns out it's quite easy and the table looks better too I think. I believe that's why GW goes to the point of obscuring terrain piece edges... to sell the illusion of a world that the models are fighting in and it's not just a table with some nice, neat, easy to identify terrain elements strategically placed around the tabletop. I'll add that you need to have the right attitude and the right kind of opponent for this to really work. If you're not comfortable with allowing your opponent to use his best judgment on whether or not his guys have just entered or left terrain and he needs to roll for difficult ground... this may not be for you. 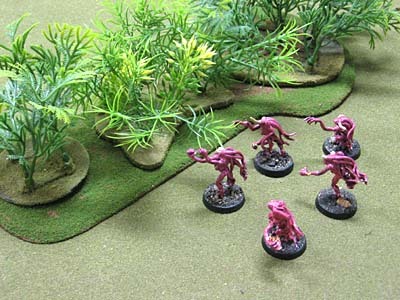 I am fortunate, my opponents are a like minded group and most of the time, the issue doesn't even come up in games despite our boards routinely having more than the prescribed 25 percent terrain on them. Besides, we all use true line of sight now anyway don't we? Think about it, try it your next game and see what happens. When you're putting the terrain down for your game, build something without giving any thought to providing balance or an advantage to one side or the other by having certain elements in certain places. Just build something that looks like it might be found in the 40k universe... and then play on it... without all the clearly defined terrain edges. I can't be responsible for any bumps and bruises you might get from trying something new. Then again, nobody learned how to ride a bike without training wheels without getting a few scrapes along the way either. UPDATE: This post is fairly old (written during 5th edition) and we're into the new edition now. It's still fun to look back sometimes. While I like a board that uses smaller, non-area terrain pieces, that can be clustered together to make a "piece of area terrain." However, I can see the value of well defined pieces of area terrain when you play in tournaments. The clearly defined borders means there is no guess work. Like most things in this game, there is a time and place for everything. Ron, its actually a good point as all our terrain is based clearly defining "what is area terrain" I think as long as you have the conversation about anything not clearly defined before the game it can work freely. I'm with you, Ron. Though I wonder about GW and I seem to recall reading somewhere that they play their Battle Report games, take notes and then "stage" the photos later. Makes sense, since I find that my BR pictures are either really terrible or taking them slows down the game so much that I never have any pictures after the 3rd turn. I've talked about terrain extensively with my game mates as it's a topic I find underrepresented. 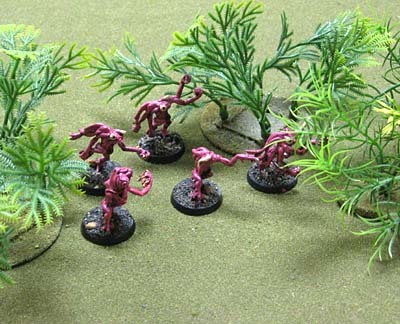 Like...we tend to gloss over terrain to keep it simple (and easy to remember what's what) but I think it would be very cool to try and detail the terrain in the same way we detail up our army lists. Something more for me to ponder! Great point Ron and something that has come up for me a couple times. 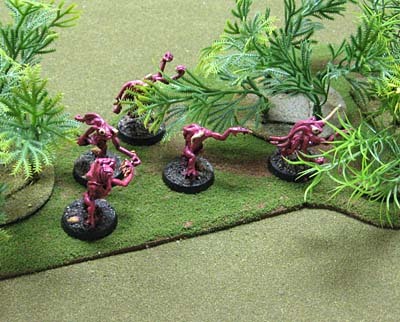 The nice thing about the trees like you have above is that they can use the "outside of the bases" method. Simply draw a straight line from the outside edge of two trees to make the area for the area terrain. It looks better and only takes a second more than having those ugly forest bases. Dunno. We play on hexagons, so the unit is either in the hex or it ain't. I agree that terrain looks better when it is not "area Terrain"- and I think you have hit on a deeper issue here- mainly what type of player your opponent is. I mean common sense should be the rule of law, but I find that - in the Warhammer games at least- players tend to be very up tight about things, to the point of being smug and elitist, and will exploit any advantage they can.... so I try and have it so there is no doubt what is and is not area terrain, unless playing against a friend or opponent I know well and who won't mind.